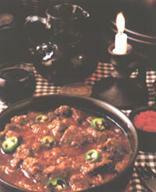 Food and cooking form an important part of Hungarian culture. 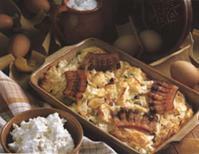 Traditional Hungarian cuisine relies on the wide variety of high quality ingredients produced in the country (e.g. meats, seasonal vegetables, fruits, honey etc.. ). Paprika and garlic is to be found everywhere. In the autumn, a fascinating view is the strings of red paprika (unground red pepper) hung on the white walls of the houses (e.g. in Kalocsa). Soup is the usual Hungarian starter; we are a “soup- eating nation”. 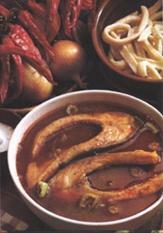 The most favourite soups are: chicken soup, potato- soup, bean- soup, peas-soup, broth, goulash, fish-soup and fruit-soup. The second course often consists of some meat and garnish. We eat various types of meats: pork, beef, lamb, turkey, chicken etc. Duck, goose and game (vad) meats such as venison (vad,vadpecsenye,öz&szarvashús) and wild boar(vaddisznó are also common. Various types of internal organs are cooked, particularly pork, duck and goose liver. Fish is also popular. Potatoes are the usual accompaniment to many dishes, but rice and pasta are also used. We flavour our meals with onion, garlic, fresh or ground paprika etc. The third course is the dessert. This can be some fruit, ice-cream, pancake or cake. Hungarian cakes tend to be very sweet and are often filled with cream. Strudel is as much a Hungarian as an Austrian dish, and is typically filled with apple, sour cherries, curd cheese or poppy seeds. 5. What is different about Hungarian cooking? 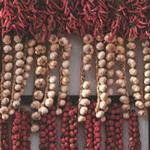 In general, Hungarians prefer rich and spicy sauces, stews and sweets over "drier" dishes. Red pepper, fresh green peppers and tomatoes, sour cream and lard are used almost deliberately. Lard or goose-fat are still used for cooking, but vegetable oils become more and more popular. The use of pastas for desserts like noodles with cottage-cheese, or "túróscsusza", egg squares with fried cabbage, or "káposztáskocka" etc. — especially as sweets with sugared nuts, poppy seeds, fruit jellies or jam — is probably peculiar to Hungary. Hungary is a land of delicious wine. The most famous Hungarian wine is the world renowned Tokaji Aszú, known as the "King of wines and the wine of kings". Tokaji (Tokay) is undoubtedly the best drink produced in Hungary but the red wines which come from the vicinity of Eger are no less reputable: Egri Bikavér and Medoc Noir. Hungary also produces lovely muscatels, rieslings such as the white wines of the Balaton region: Badacsony Riesling, Kéknyelû, Szürkebarát. 1 1/2 oz. lard · 2 medium-sized onions · 1 tbs. paprika · 2 lb. beef (thick flank and fillet ends) · 1/2 raw grated potato · 1 tbs. tomato purée · 4 1/2 pints bone and vegetable stock · 1/2 tsp. caraway seeds · 1 lb. potatoes · 1 green pepper. For csipetke: 6 oz. flour ·1 egg · pinch of salt. Fry finely chopped onions in lard to a golden color, add paprika. the beef cut into walnut-sized cubes, caraway seeds and the grated raw potato. Cover and simmer for about 10 minutes, stirring occasionally. Add tomato purée. half cupful of stock: simmer till meat is nearly done. Then add the remainder of stock, bring to the boil, add potatoes cut in small cubes. If available add some sliced green pepper to the gulyás; in my opinion it gives the finishing touch to an excellent dish Csipetke. 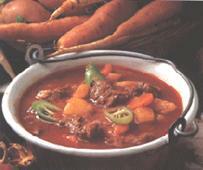 Genuine Hungarian Gulyás Soup is garnished with csipetke. Make them as follows: sift flour into a bowl, add egg and salt. Knead ingredients into a stiff dough. Flatten between your palms and pinch into small, bean-sized pieces, add to the gulyás and boil slowly for 10 minutes before serving. Hungarian style fish soup, or "halászlé", prepared in various ways from region to region. Wherever it is made the basic secret is said to be the same: a stock is cooked from many small bodied fish of different flavor, which is then strained and in which the meat of "nobler" fish (carp, sheat-fish etc.) is cooked. Clean fishes. Cut carp into even, finger-thick slices. Salt and put slices aside in a porcelain dish. Put the fishes with the head and tail of carp into a bowl and add finely chopped onions. Cover these with water and cook slowly about 1 hour. Strain liquid through a fine strainer and add 2 pints cold water. Bring it to the boil and add red pepper, peeled and chopped tomatoes and green paprika, salted carp slices. Cook slowly under lid for 10-15 minutes, shaking the saucepan every now and then. Do not stir. 1 1/2 lb. 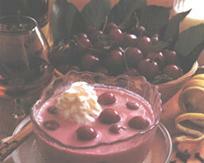 morello cherries · 3 pints water · 2 gills sour cream · 1/2 pint dry red wine · 1 egg yolk · 6 oz. sugar · the peel of half a lemon ·1 inch-sized piece of cinnamon · 2 tsp. flour · pinch of salt. Stone the morello cherries, then put them to cook together with sugar, salt, lemon peel, and cinnamon. Allow to simmer. Meantime, mix in a bowl the flour. egg yolk and 1 gill of sour cream. Mix with a ladleful of soup, then add to the boiling soup stirring constantly. Finally, mix wine and other half of sour cream. and add this to the soup as well. After 10 minutes of simmering put soup aside and let it cool. Take lemon peel and cinnamon out before cooling. This soup is excellent when chilled. It can be made from gooseberries, black-berries, raspberries or red currants as well. 2 lb. boned knuckle of veal · 2 large onions · 4 oz. lard · 1 tbs. paprika ·1 green pepper ·1 tomato · 1 tsp. salt. For the stuffing: 1 1/2 lb. shoulder or best end of pork. ·2 oz. streaky bacon. · 1 egg. · 2 oz. cooked rice. ·1 oz. lard ·1 small onion. · pinch of salt · pinch of ground black pepper. Cut cabbage leaves in two, trimming of the thick vein in the middle. Mince the meat together with the bacon. Heat lard in small saucepan, add finely chopped onion and fry till golden-yellow. Pour it over the minced meat. then add cooked rice, 1 egg, salt and pepper. Knead mixture well together. spoon even heaps onto the cabbage leaves. Roll them up. push the edges of leaves in at both ends. Put the sauerkraut into a large saucepan, add 1/2 pint water, bring to the boil. Arrange the stuffed cabbage leaves on top, cover and simmer slowly for 1 hour. 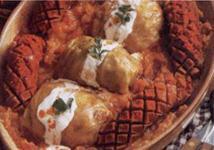 Remove stuffed cabbage leaves from top into a deep dish but keep them hot under cover. Heat 2 oz. lard in a small saucepan. add flour and fry till golden- brown, then add this roux into the sauerkraut. Stir well, bring to the boil, add sour cream and boil briskly for 5 minutes. Spoon sauerkraut and gravy over stuffed cabbage leaves and serve hot. In Hungary garnish is not served with stuffed cabbage. Cook noodles in plenty of salt water. Cut bacon into small cubes meantime, and fry on low heat till crisp. Lift out bacon, put aside. Drain the cooked noodle. then put into the bacon-fat in the saucepan. Lower heat under saucepan then add sour cream. Stir, pull aside and add the crumbled cottage-cheese and chopped dill. Put immediately into a hot dish. sprinkle the chopped, fried bacon on top and serve. Put in a cup a spoonful of sugar. crumbled yeast and 1/4 cup milk. Leave to rise. Put the flour in a bowl, rub butter lightly into the flour till mixture is crumbly. Add egg yolks, sugar, the risen yeast and enough sour cream to make a not too soft dough. Knead thoroughly, then cover with cloth and let dough stand for at lest 3 hours. After this time turn out onto a floured pastry-board: divide in two, shaping a ball of each part. Roll dough-balls out to 1/3-inch thickness, spread generously with the filling and roll up neatly. Place rolls into a very lightly greased oblong baking tin, brush top with egg, leave to rise 1/2 hour longer. Then brush the top of the again with egg, and bake in a medium oven for 20-30 minutes. Filling: Put the sugar into a saucepan together with 2 tbs. water. Stirring constantly. add ground walnuts as soon as sugar is melted. After 5 minutes add flavourings, put aside to cool. then stir till creamy, and use.